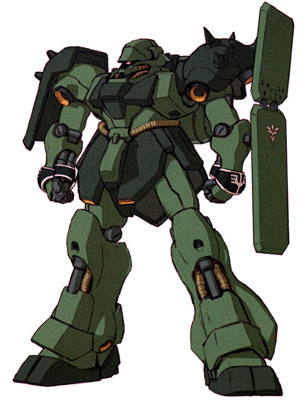 The AMS-119 Geara Doga is a general purpose mobile suit with technology and design features descended from the old MS-06F Zaku II mobile suit. Since the resources of Char's Neo Zeon are limited the Geara Doga was not a particularly high-performing mobile suit when compared to the machines that Haman Karn's Neo Zeon produced during the First Neo Zeon War only four years earlier, however they were well in line with the style of mobile suit design of the day. Although it wasn’t really a high-performance suit it was enough for most soldiers, easy to mass-produce and thanks to its wide variety of weapons it could be a threat for the Earth Federation's own mass-produced suit, the RGM-89 Jegan.